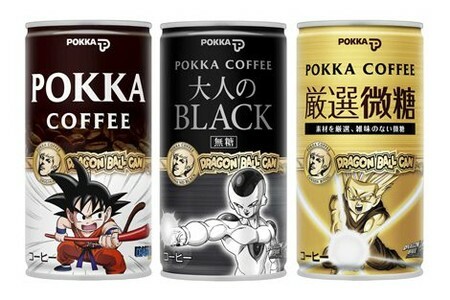 POKKA collaborates with Dragon Ball for their canned coffee! POKKA Corporation has announced that they would collaborate with Dragon Ball for their long selling canned coffee brand, "POKKA COFFEE", with 30 different�designs�for a limited time period. POKKA has collaborated with "Kinnikuman" or "Hokuto no Ken (Fist of the North Star)" in the past, which targeted on the consumers in�their�30s~40s and received a favorable review. �Since Dragon Ball has many fans in all different generations, this collaboration will sure grab more attention. There will be total 10 different designs for "POKKA COFFEE Original DRAGON BALL CAN infancy ~ Saiyan Saga", �another 10 different designs for "POKKA COFFEE Otona no Black DRAGON BALL CAN Frieza Saga", and also another 10 different designs for "POKKA COFFEE �Gensen Bitou DRAGON BALL CAN Androids & Majin Buu Saga." On each can, the main characters from each saga will be illustrated. Starting on June 6th, the set of all 10 cans for each product, which will include 10 original postcards and a photo frame for the display, will be on sale on Pokka's online shopping site. Yuzu to sing theme song for "UNITED STATE OF ODAIBA 2011"
Kitagawa Keiko, AKB48's Watanabe Mayu + more show their summer fashion for "Zipper"